Has anyone ever tried using a simple brine on chicken wings before Vortex'ing them on a kettle? A simple brine of Kosher salt and baking powder (like here). I think I may just give it a shot some time this weekend. I have done them that way before. I don't know that it made that much of a difference. The skin was a little dryer than with the Vortex. With the heat the Vortex provides the skin will be plenty dry. Welcome aboard! I have a bad habit of not looking at the intro forum but you found an excellent, professional resource here at TVWBB. I'm not an expert cook and have been smoking for 2 1/2 years, so I'm not going to give advice on brining vs not brining wings. Let me prove my lack of formal cooking expertise: When I eat wings I don't think so much about them being juicy or dry. I look for a little snap of the skin, overall texture, and of coarse the taste of the sauce. And sometimes I want a wet sauce while, at other times, I want my sauce to be set. I refer to the skin with a "snap" because, in my feeble mind, the skin is never truly crispy by my personal definition (unless I'm talking about chicken with a breading that crisps firmly). I've never read of using baking powder to aid with skin texture but I have read (and tried) baking soda. I will brine in water/sugar/salt and the results are always excellent. Be sure to dry them out before cooking for the crispy skin. Thanks for the reply (everyone), but you mention the skin being dry... Dry as in too crispy, or what do you mean? The meat wasn't dry though, right? I like the skin to be crispy on my wings. I can accomplish that with the Vortex without drying out the meat. I don't dry brine mine. Why not try them with the brine this weekend and without the brine next weekend and see what works best for you. the fat to drain away leading to crisper skin. 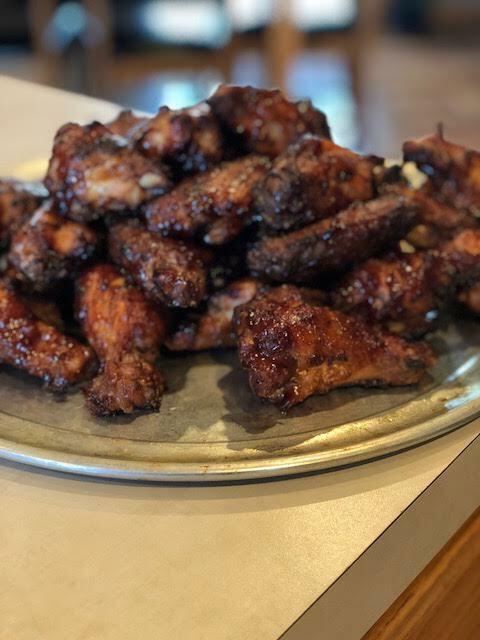 So I tried the dry brine yesterday on about 6lbs of wings cooked on a kettle w/ the vortex... They were great, but a bit too salty for me and my kids' tastes. I didn't really follow the recipe for the brine (my mistake), so I have nobody to blame but myself.